Encaustic tiles or cement tiles are a new and growing trend among architects and interior designers in the United States. Encaustic or cement tiles are commonly referred to as cement tile, encaustic tile, french cement tile, spanish cement tile, mosaico hidraulico, mosaiaco, and carreaux ciment. The 1960's construction boom in the USA and Western Europe demanded economical buildings materials that brought an end to the common use of this product in both residential and commercial application. Fortunately, a recent resurgence has occurred to force construction companies, architects and interior designers to consider encaustic tiles as a beautiful, durable flooring alternative. Encaustic cement tile can be customized using new molds, custom colors and by modifying the colors that are used in an existing pattern. 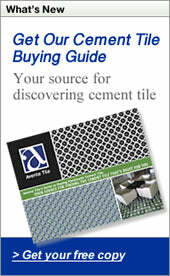 Cement tile offers the widest range of design possibilities in both color choice and patterns of any flooring. It is extremely durable and easy to maintain. Cement tiles are manufactured using methods similar to those used by the Arabs over ten centuries ago. Today however, cement tiles use a manufacturing process that allows them to be mass-produced. This groundbreaking technique was developed and refined in the late 19th century and eliminated the need for firing to harden the tiles. The new technique uses a hydraulic press and mold to apply the different colors of the pattern. Tiles created using the new method are hydraulic tiles. No firing is required and the tiles simply dry and cure for a few weeks after pressing. This process is similar to concrete that is poured in place. Cement tiles popularity grew because of this new "single-step" process. Traditional methods required separate color applications and repeated firings. The original process was an extremely labor and time-consuming one. Hydraulic tiles are about 1" thick and generally consist of three layers. Each layer plays an important function in the durability and design of the tile. As you might guess, cement tiles are made of cement, sand, powdered marble and mineral pigments. The top layer measures about 1/8" thick. It consists of a mixture of white Portland cement, marble powder, fine sand and mineral base pigments. This surface is the decorative pattern you see. For each color that is required, blended pigments are placed in the corresponding section of a mold. The second layer, or middle layer, is about the same thickness as the top layer. It's made of a mixture of grey Portland cement and fine sand. The middle layer functions to absorb excess water from the top layer. The third layer is approximately ¾" thick and is a of a mixture of grey Portland cement, regular cement, sand and limestone powder. It is porous and made it easy for the tiles to adhere to the floor during installation. Cement tiles come in a multitude of designs and existing patterns are plentiful. Typical patterns use geometrical shapes and stylized floral patterns. The most common designs used on cement tile flooring patterns are similar to a rug or carpet. The "carpet" consists of a central panel that is repeated pattern framed with a border. Usually a plain or solid color field tile is used to "fill-in" the remaining shape of the floor in a subtle, complementary color. Color choices in both the pattern and field tiles are unlimited. Most manufacturers have a stand pallet ranging from 25 – 50 colors and custom colors are usually available. The most typical or common size is 8" x 8"; but, hexagons and smaller or larger squares are readily available. Because it is a green product, very durable and available in almost limitless colors and patterns, it's easy to understand why cement encaustic tiles are a new trend. One that will last!